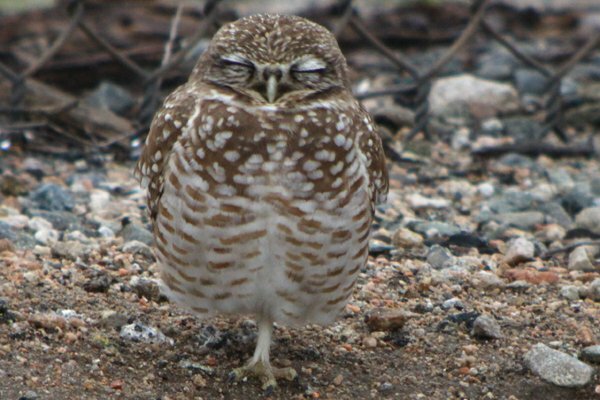 I have long wanted to see a Burrowing Owl. They are owls, which automatically gives them a certain cachet, and they are little, which makes them cute, and they live in the ground, which makes them even more interesting than your run-of-the-mill owl. Several years ago I had the perfect opportunity to see Athene cunicularia at the Salton Sea but before Daisy and I got to their burrows an enormous windstorm picked up and the amount of dust in the air made visibility nearly nil so we did not see the owls. When I was in Ecuador this past November at Pululahua Hostal I could have seen Burrowing Owls but they had switched burrows and Renato did not know where in the vast caldera they had gone. And, of course, with Larry being a beat writer on 10,000 Birds now I have to read posts like this with amazing images of, and information about, Burrowing Owls without turning green with envy, a difficult task as I am sure you can imagine. 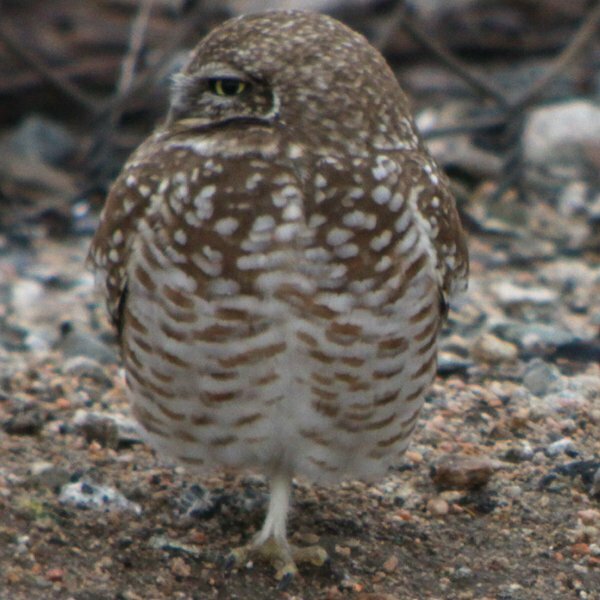 Anyway, it seems that Burrowing Owls are not an easy bird to find in Orange County, California, where I was staying over the holidays, but there are populations in other parts of southern California. I saw on one of the local listservs that some owls were spotted on the San Jacinto Christmas Bird Count, not that far from Orange County, so I contacted Tom Benson, who wrote the email, and he let me know that I couldn’t chase the owls from the count because they were on private property, but that he knew of another population outside the San Bernardino Airport. He gave me exact directions and wished me luck…which is how I found myself staring through my Swarovski scope into the yellow eyes of my first-ever Burrowing Owls on Monday morning before the rain arrived. I spent about fifteen minutes with the owls, and didn’t see them do much beyond what you see in the image above. The bird sitting out in the open would look to its left and then turn its head and look to its right and then turn its head and look to its left and then turn its head and look to its right and so on and so forth. I really wanted the perfect picture of the owl staring directly at the camera but every single time it turned its head towards me it would blink. I have at least ten pictures like the one below. Despite the lack of activity and the blinking tendency of the owl I was absolutely thrilled to finally get a look at a long-wanted life bird, a bird that has been on my most-wanted list for quite some time. Here’s hoping they are around for a long time to come…another reason to check out Larry’s recent post and sign the petition. Let me be the first to congratulate you on your Burrowing Owl lifer Corey! I am thrilled for you. They are most active at dawn and dusk and you’re right, they do a lot of looking left and right and if there are other raptors flying overhead, looking up! I don’t know how close you got but when they are awake, they will usually spend much of their time with at least one bird per group watching you. That is to say, looking directly at you. You must have been far enough away that you were of no concern to them whatsoever. That last photo looks like the typical BUOW snoozing pose. Very cute indeed. Great looking bird, congratulations Corey! I know the frustrations of seeing a great bird and trying to get a great image at the same tiime. This last December I stumbled upon a Black-bellied Starling nest in a tree trunk and spent more than an hour trying to get the perfect shot. But shots with the head turned away, head already in the cavity, blurred or flying off far outnumber the decent shots. The birds spent a lot of time away from the nest foraging, so it took a lot of waiting and then rapid activity as the birds approached, shot into the nest and took oof again with the faecal sacs, definatley not a hobby for impatient people. I put two shots on my blog at http://www.thelazybirder.blogspot.com. Congratulations, Corey! I still remember being thrilled the first time I saw them. It’s no wonder – they are beyond cute. Corey, your post totally delights me, for several reasons. First, because the location seems to be a dependable one. 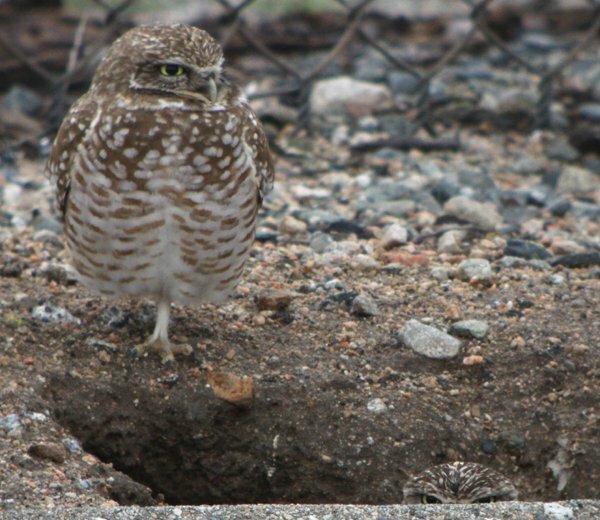 [Birding pal Sandy Remley and I saw one Burrowing Owl there last year, and I saw one in the same spot this January 5.] Second, because the owls in your photograph are at the mouth of an actual burrow — mine was at the mouth of an owl-sized drainage pipe. More burrows and more owls, yay! And finally, because it’s just fun to know that Corey of 10,000 Birds was birding in my neck of the woods. Congrats on this new and most excellent life bird! @Larry: Thanks! And I kept my distance, with a very wide ditch between me and the owls. Despite the distance, the lower owl did tend to keep its eyes on me though it was mostly obscured. @Gareth: Thanks! And it is really all about patience when it comes to bird photography. @Wren: They really are the most adorable little owls. @Luisa: Your comment just totally made my day. Seriously, thanks so much! Congratulations! Seeing the Burrowing Owls at Brian Piccolo Park, FL is one of the mandatory activities when I visit my nephews(http://www.flickr.com/photos/queensgirl/4443743306/). They are quite active during the day in early spring (the owls, Jake and Zach are never not active); in late spring we see the owl families sitting in the sun by their burrows, which line the soccer and baseball fields (http://www.flickr.com/photos/queensgirl/3583427825/). Jake and Zach don’t understand why the Mama owl stretches out and hisses at them when they get too close, so there is also a lot of learning going on too. Thanks, Donna! And great pictures! My name is Fred and I’m learning about Burrowing Owls for a school project. If you can send me some pictures of your owls I would love to show my teacher! Can you tell me why you take pictures of the owls? Are you trying to help save them? Where Are You Birding This Second Weekend of January 2011?